Retrieval Artist Miles Flint gets an urgent message from his mentor, Paloma. But by the time he arrives at her apartment, she’s dead, the victim of a terrible murder. The police, already on the scene, think Flint’s connected to the death. Effectively frozen out of the investigation, he starts one of his own, and discovers secrets that Paloma kept, secrets that make Flint question everything he knew about her, everything she taught him about honor, ethics, and being a Retrieval Artist. Miles Flint’s office was covered in dust. He stood inside the once pristine room, hands on his hips, and surveyed the mess. Moon dust—fine and golden—covered everything: his chair, his desk, his computer systems. The white walls—covered with a substance that looked like permaplastic but wasn’t—were now dark brown with filth. The air tasted gritty. The dust had worked its way into his mouth, and he’d only been here a few minutes. And he hadn’t even seen the back room. He gave a verbal override command—one of the few verbal fail-safes he’d left from the days when this office had belonged to Paloma—and the lights came up. They were sepia-toned, not because he had commanded them that way, but because the dust had infiltrated their systems as well. If the dust was in the lights, then it was in the filter systems, the state-of-the-art air purifiers, and all of his sensors. He wouldn’t be able to work in here until this place got cleaned, and he’d have to clean it. He had too many confidential files, too many illegal systems, to allow any cleaning service into the building. He sighed and rubbed a hand over his grit-covered face. This was his own fault. After his last case, he’d just vanished. He had already been in his space yacht, the Emmeline, and instead of bringing her back to Armstrong Dome’s port, he turned her away from the Moon, going places he’d only heard of. For a while, he thought he’d never come home. Then he realized that no matter where he went, he’d always be restless, always be lonely, and always be alone with himself. He came back—to dozens of messages on his system (none of which could reach him on his travels; he’d been too far away for the standard links to work). Messages from Ki Bowles, a reporter for InterDome Media, who seemed to believe that Flint wanted to talk with her, even though he’d warned her to stay away from him. Messages from possible clients, and messages from Noelle DeRicci, his former partner at the police department, now Security Chief for the United Domes of the Moon. DeRicci’s messages had gotten increasingly shrill over the months he was away—wondering what had happened to him, begging him to contact her so she wouldn’t worry, hoping that he was all right. He did contact her the moment he could—just outside Armstrong Dome’s restricted space—and told her he’d been on vacation, and didn’t know he had to report in. He sounded a little annoyed, even though he wasn’t. He was surprised at her concern. The annoyance was for whatever authorities had been listening in, so that they wouldn’t think anything more important had happened. All that happened, really, was that he had allowed a man to die. A man who, in all probability, should have died. Only the method forced Flint into reexamining everything he thought about himself and his new career. Paloma had warned him that he had become a Retrieval Artist for the wrong reasons. You see it as a way to save people, she had said early in his training. In reality, you will kill many more than you save, even if you do everything right. He had told her he believed her. Maybe he even had. He certainly thought Retrieving was better than working for the police department, which had him enforcing laws that he couldn’t believe in, laws that cost so many lives for such silly reasons, that he couldn’t enforce them even if he wanted to. Anything was better than that. He sighed, swallowed a mouthful of dust, and coughed. Sweat ran down the side of his face. Everything had shut off when it got clogged, so the temperature regulators were gone, too. He might not be able to save his computer systems. They were sensitive; they might have malfunctioned in the warm, dirt-filled conditions. Something had broken down while he was gone—or someone had tried to sabotage his systems (and succeeded, although probably not in the way they intended)—or the stupid young lawyer next door had somehow compromised Flint’s office, accidentally drilling some kind of hole between them or shutting down the power to the entire area (although that wouldn’t have caused this; Flint had backups built into his power systems as well) or accidentally cracking the only wall they shared. That wall was the weakest one in Flint’s office. He hadn’t been able to reinforce it on both sides because the lawyer’s predecessor—an older version of the same sort of incompetent—hadn’t allowed Flint access. They—and a couple other renters—shared one of Armstrong’s oldest buildings, put up by the original colonists. The exterior was made of original permaplastic, and a plaque, somewhere on the side of the building, noted all of this as if it were a good thing. Mostly it had been. The building looked like it was going to collapse at any moment, which hid Flint’s wealth and made many of his potential clients turn away. The last thing any Retrieval Artist—any reputable one, anyway—wanted was a lot of clients. He slogged over to his desk, the inside of his shoes filling with dust. Everything had to have been off for at least a month, maybe longer, to accumulate this much through the cracks in the walls, the thin line under the door. The dome filters in this part of Armstrong were poor. Not all of the roads in this section of town were covered, and some were covered in permaplastic, so the dust that made up the Moon itself was an ever-present part of this sector of the city. And now a part of his office. He tapped the computer screen built into the top of his desk, pressing his finger down hard so that the machine felt the warmth of his skin, took his DNA sample and his fingerprint, and turned the system on. For a moment, he thought it wasn’t going to work, then a shrill squeal nearly knocked him to his knees. He reached for the system to shut it off, when the squeal vanished, replaced by momentary static. He frowned. His system had static? He wasn’t even sure that was possible. Paloma. The voice belonged to Paloma, his mentor. He peered over the desk, trying to see when the call was logged in, how very long ago. He hadn’t contacted her since he got back, but it wasn’t uncommon for them to go months without speaking to each other. The system hadn’t turned on. It was still black. Which meant that the voice was coming through his links directly into his own mind. He hadn’t heard that squeal; he had felt it, absorbed it—somehow it had all gotten in—which he hadn’t thought possible. This office was supposed to be protected against any outside access. He had no way of knowing if the cries were real or fake. He put a hand to his ear, staggered outside, and pulled the door closed. The Dome was in Mid-Afternoon, the light sepia because of the dust clinging to the bad sections. He sent a ping back through the links—he knew they worked properly here—and got an address reading along his lower left eye—Paloma’s residential tower. As far as his links could verify, the cries were coming from her. I’m coming! he sent back. Then he jogged to his aircar, parked only a few meters from the office. He hadn’t locked up. He hoped the office door still locked itself automatically. He couldn’t turn around to fix it, though. He had to get to Paloma. She’d never called him for help before. Should I send for the authorities? He sent. And then the transmission shut off. The static reappeared for a brief moment, then disappeared as well. He tried to reestablish contact, but couldn’t. He sent an emergency beacon to her building’s security, warning them that something had happened in her apartment, but he didn’t send any other transmission along that link. Let them go up and see what was wrong. Maybe they would scare whoever—whatever—it was away from her. He unlocked his aircar, slid in, leaving a dust trail all over the seat. He was covered in the stuff. He put the car on automatic, told it to take him to Paloma’s and quickly—traffic laws be damned—and as the car jerked into the air, he shook the dust off himself as best he could. Dust was trace. He was going to leave parts of himself all over the city if he wasn’t careful. He was thinking like the cop he used to be. Something in Paloma’s message had triggered that cold, calculating reaction—watch what you touch, what you bring to the scene, what you’re doing. He made himself breathe deeply—the air in the car was clean, at least—and clung to the wheel as the car wove and bobbed its way through traffic, swerving around the tall buildings that composed the section of town nearest to Paloma’s. Alarms beeped in the car’s interior as the vehicle flew into restricted airspace or got too close to the dome itself. 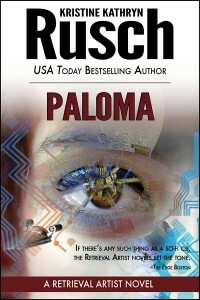 No matter how many more messages he sent, no matter how hard he tried, he couldn’t reach Paloma. It was as if her personal system had vanished—as if it hadn’t existed at all. His knuckles were white. His fingers ached. He made himself let go of the steering wheel—shut off because the system was on automatic—and flex them. It took him a moment to realize why he was so worried. Paloma had never asked him for help. She was the most competent person he knew. She had been in more terrible and terrifying situations than he could imagine, and she had come out of them unscathed. She had never needed him before. She had never sounded frightened before. He had no idea what had changed.